The thrill of free-falling from a rope swing, high boulder, or diving board is quickly usurped by the jolt of icy water that engulfs your body upon plunging into the aqua-blue depths. 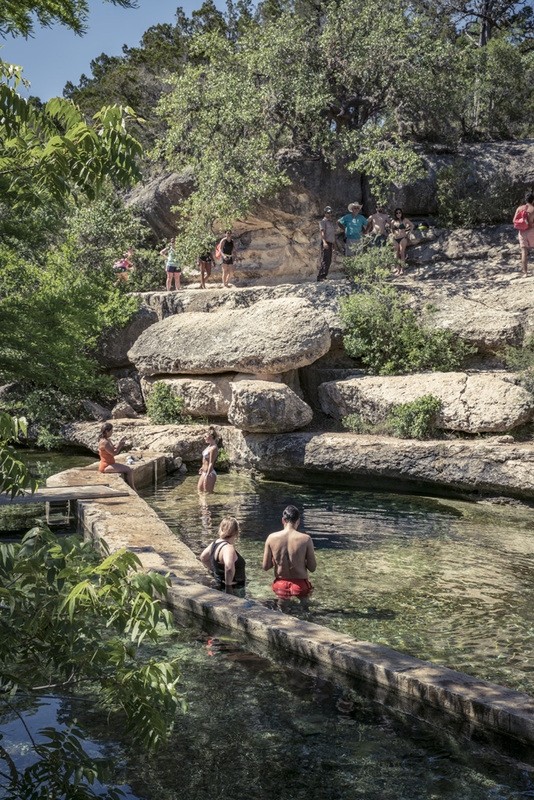 These sensations and other life-nourishing elements have drawn people to Texas’ historic spring-fed swimming holes for more than 10,000 years. Texas Historical Commission markers across the state note that American Indians frequented these natural springs to hunt animals drawn to the reliable water sources. 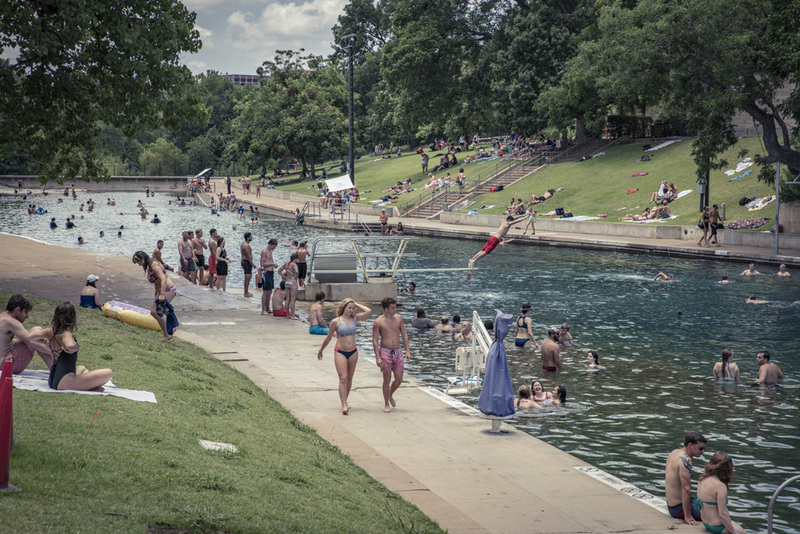 In the process, the early Texans undoubtedly dipped into the clear refreshing pools to cool off on a hot summer day. 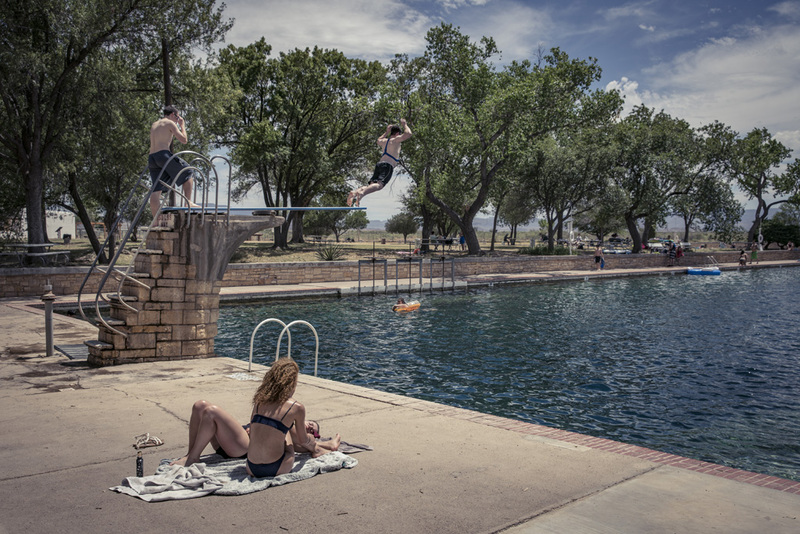 These days, heritage travelers and locals value the springs’ recreational relief, but they don’t often question the geological source. 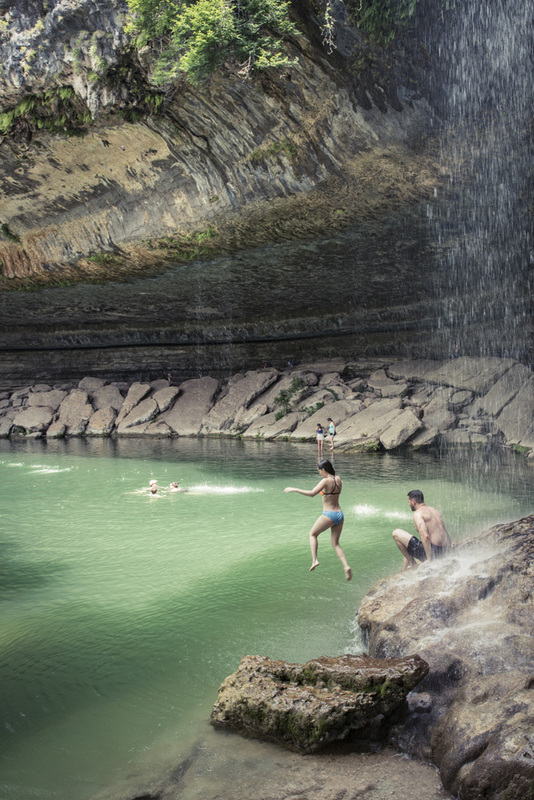 How did these swimming holes form in the first place? 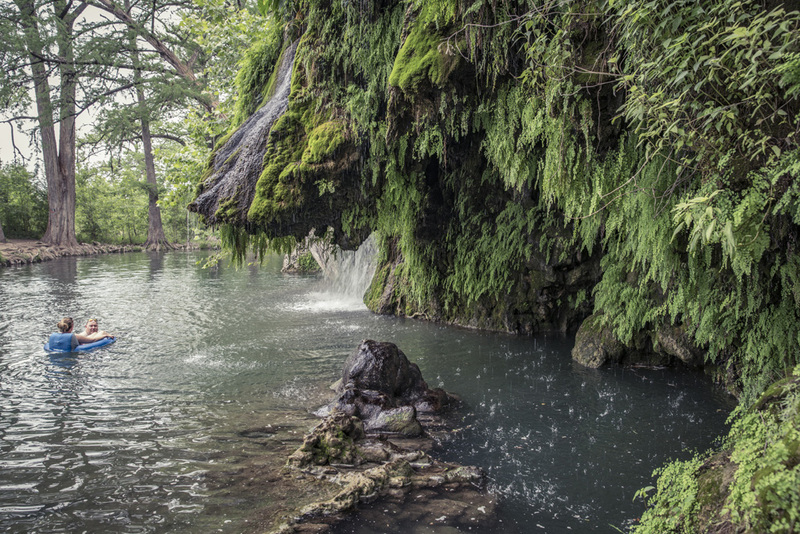 According to Texas State University’s Sam Massey, an assistant manager for education at the Meadows Center for Water and the Environment (MCWE), the springs originate when a fissure forms in the aquifer’s limestone. These are typically found along faults where the rock is fragmented. In Central Texas, the Balcones Fault provides the fractures for water to flow from the subterranean Edwards Aquifer through natural conduits, which become springs. As a result, the steady flow along a creek or river often provides a natural pool, which can become a swimming hole. 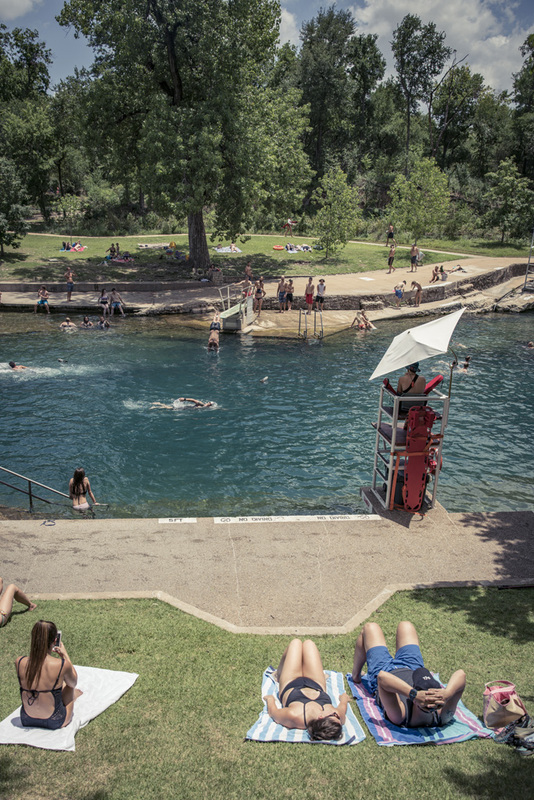 The San Marcos springs were dammed circa 1850; a century later, the pool (Spring Lake) became the centerpiece of Aquarena Springs amusement park. It now hosts the MCWE’s glass-bottom boat tours. 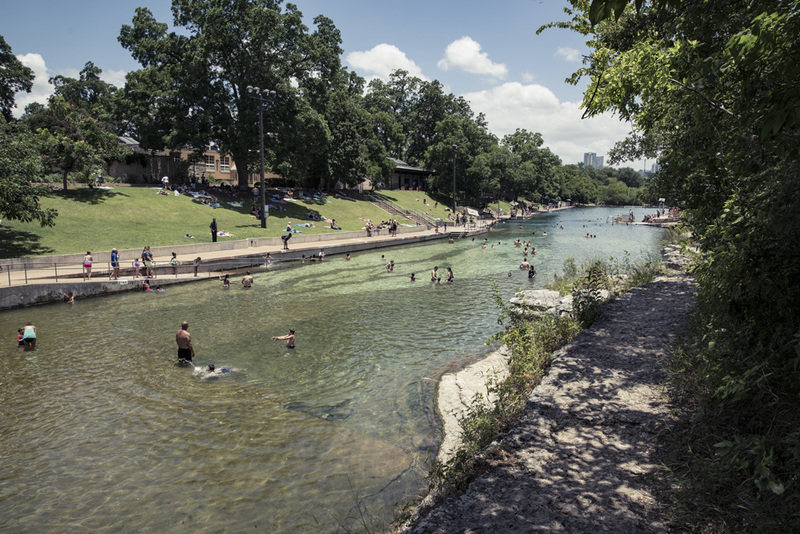 The springs also feed the San Marcos River, where Rio Vista Park—featuring a historic dam with a chute of swiftly flowing water—draws swimmers, paddlers, and sunbathers. 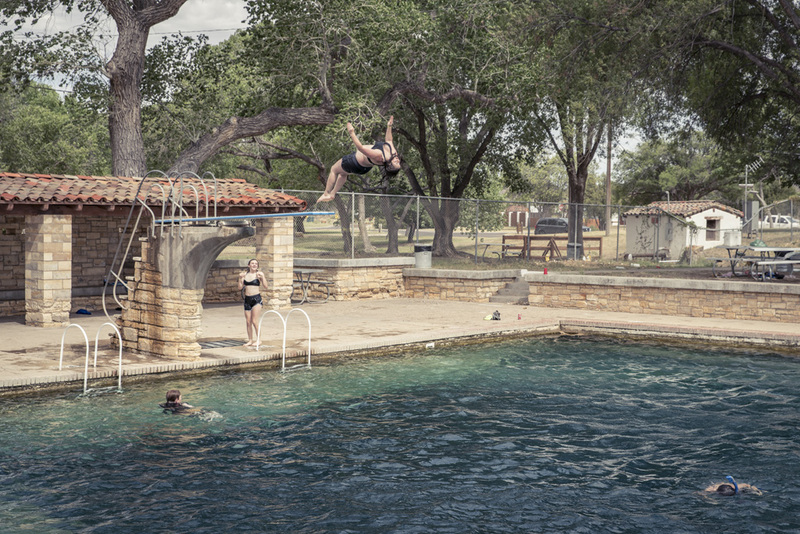 More than 3,000 springs babble across the state, but Texas’ best-known historic swimming holes are clustered along an arc hugging the eastern edge of the Hill Country—from roughly Austin to San Antonio and continuing westward toward Del Rio. 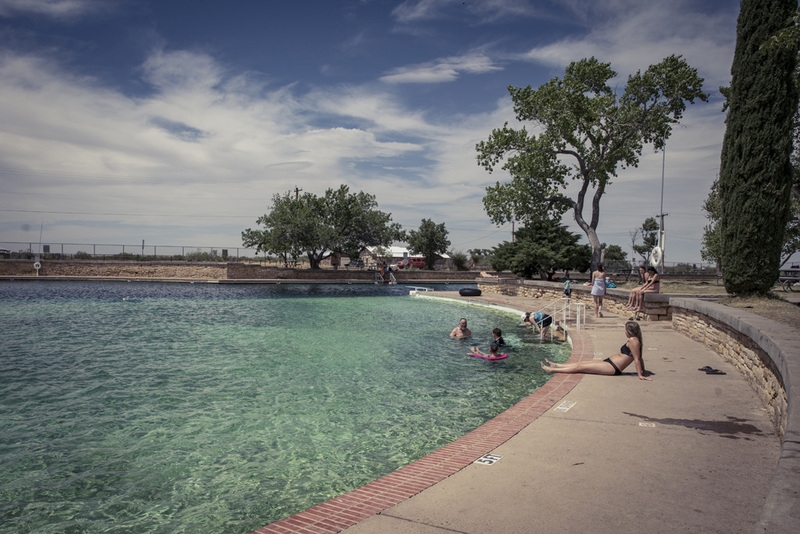 Hundreds of miles away in Far West Texas lies Balmorhea State Park’s pool, an iconic Texas swimming hole fed by nearly 20 million gallons of water gushing daily from San Solomon Springs. According to Tim Roberts, Texas Parks and Wildlife Department’s cultural resources coordinator for the West Texas Region, the San Solomon Springs likely receive their water from nearby mountains. Runoff from the Davis Mountains and other ranges farther west supply the groundwater that has nourished the area for millennia. 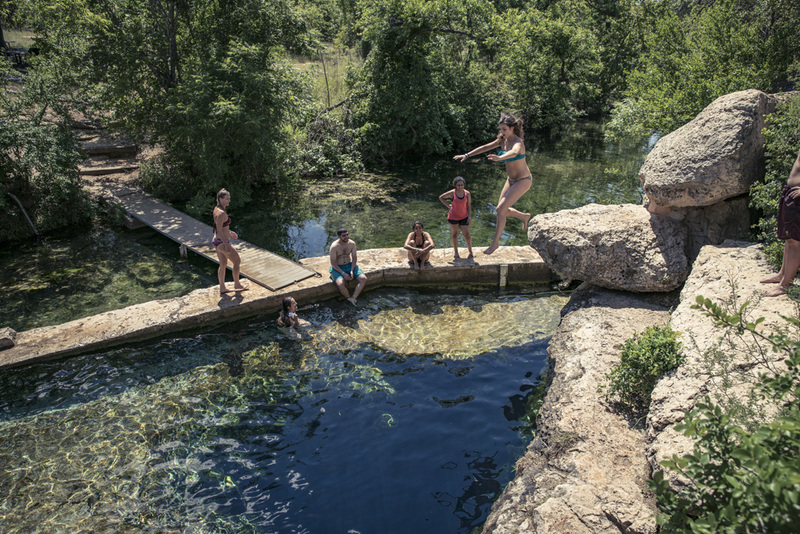 There’s no documented evidence of ancient water toys or games played in the state’s historic swimming holes, but Texans of the past were likely leaping from lofty spots to experience the unique thrill of descending into a cool spring-fed pool on a scorching summer afternoon. 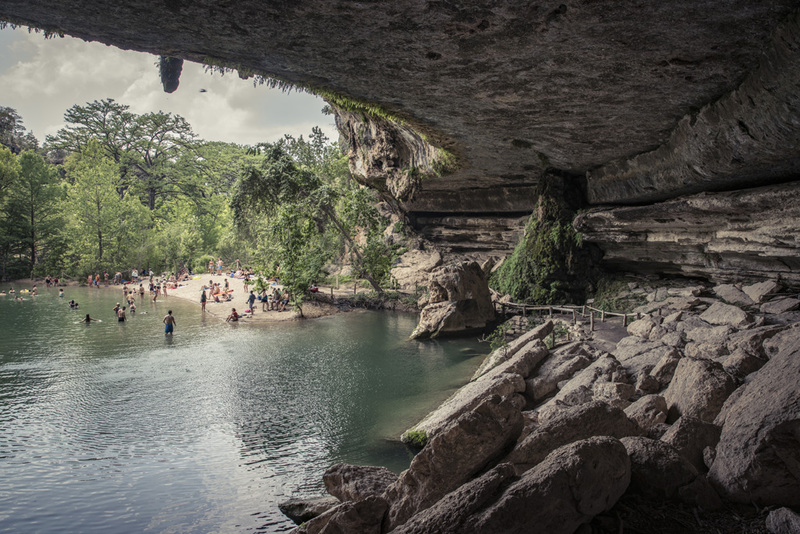 If you visit only one Texas swimming hole this summer, opt for Hamilton Pool 24 miles west of Austin. Beyond stunning, the panoramic beauty awaiting at this lush wonderland includes a waterfall plunging more than 50 feet from an arced terrace into an azure pool. 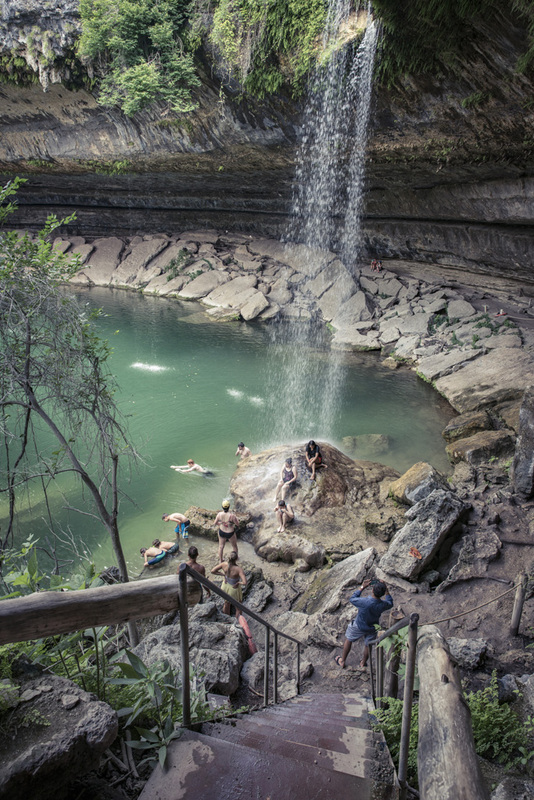 According to Michael Brewster, parks supervisor of Travis County’s Hamilton Pool District, the waterfall originates as natural springs near the curved geological formation, which is a collapsed grotto dating back thousands of years. Tonkawa and Apache tribes lived nearby, and the property was eventually purchased in the mid-1800s by the brother of Texas governor Andrew Hamilton. “It’s a very beautiful place. People think of it as only a swimming hole, but they don’t always appreciate the history of the natural preserve around it,” he says. Note: due to overwhelming demand, the county has implemented an online reservation system (capped at 70 visitors daily). 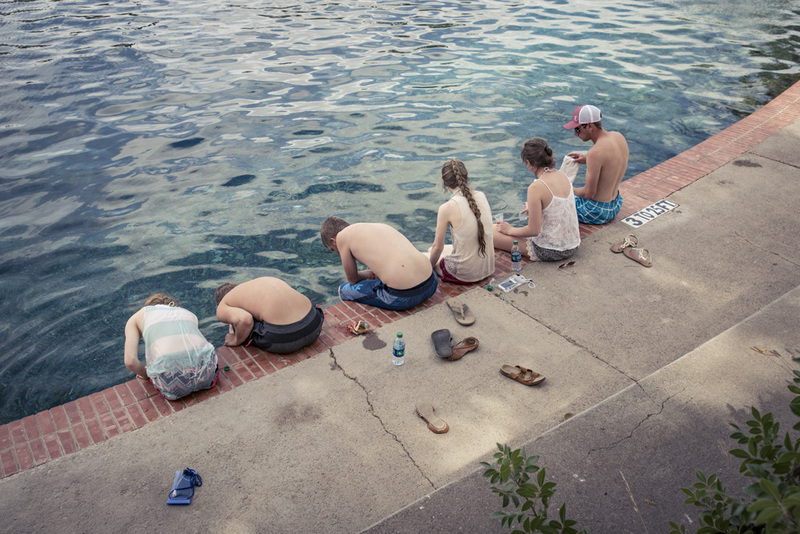 Barton Springs is deservedly referred to as Austin’s crown jewel, and the constant 68-degree flow of water—up to 80 million gallons daily—provides revelers a cool respite on triple-digit summer days. A THC marker notes that Spanish missions once occupied the banks in 1731 (no trace of them exists), followed in the 1800s by a merry-go-round, riverboat, and ice machines. 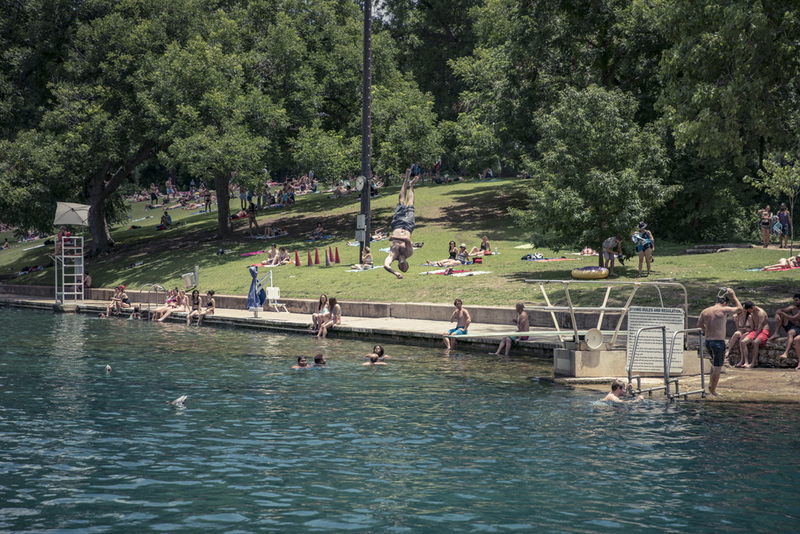 Today, Barton Springs remains a natural escape in this rapidly growing city. An ample hillside offers a shady place to relax while watching swimmers of all ages attempt varying degrees of daring jumps from the diving board. 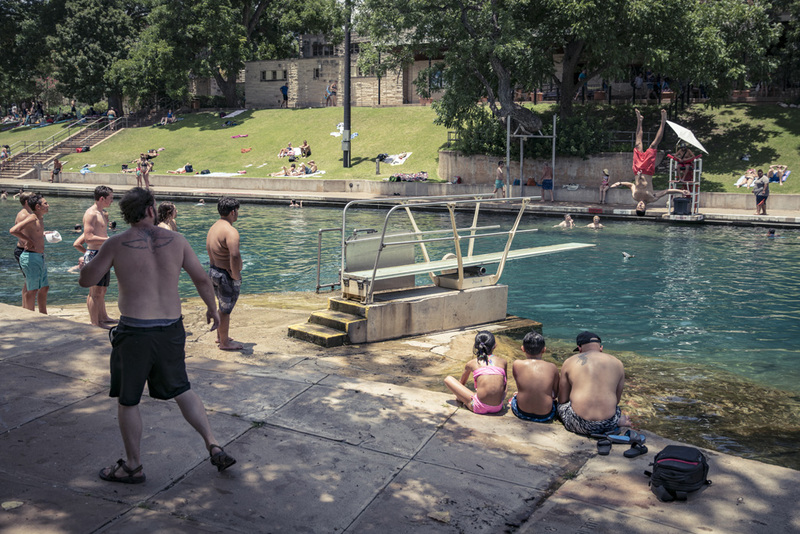 A mile upriver is Deep Eddy Pool, which celebrated its centennial in 2016. 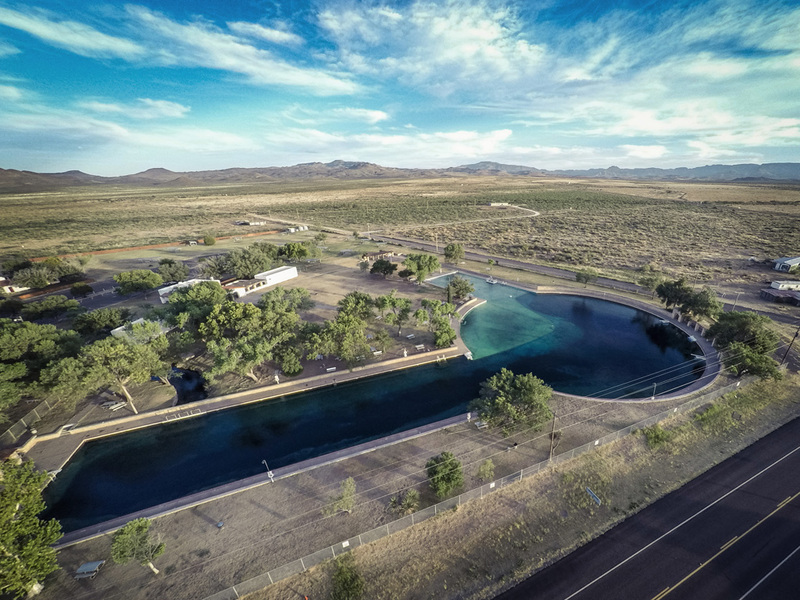 Named for an eddy (circular current) formed by a large boulder, this National Register-listed site is distinctive for its immense 600,000-gallon capacity pool and tree-filled surroundings, providing a cool compliment to the 70-degree water. 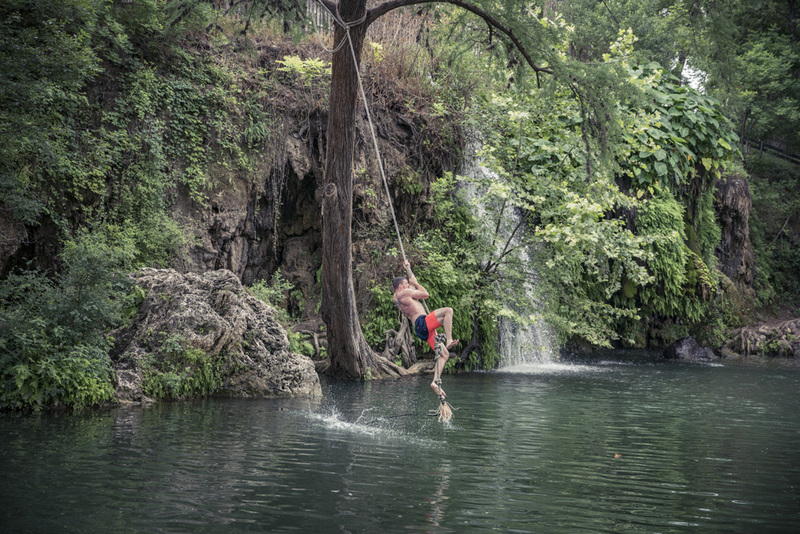 Step back in time at this historic Hill Country swimming hole, a refreshing privately owned property operated by the Krause family for more than 50 years. 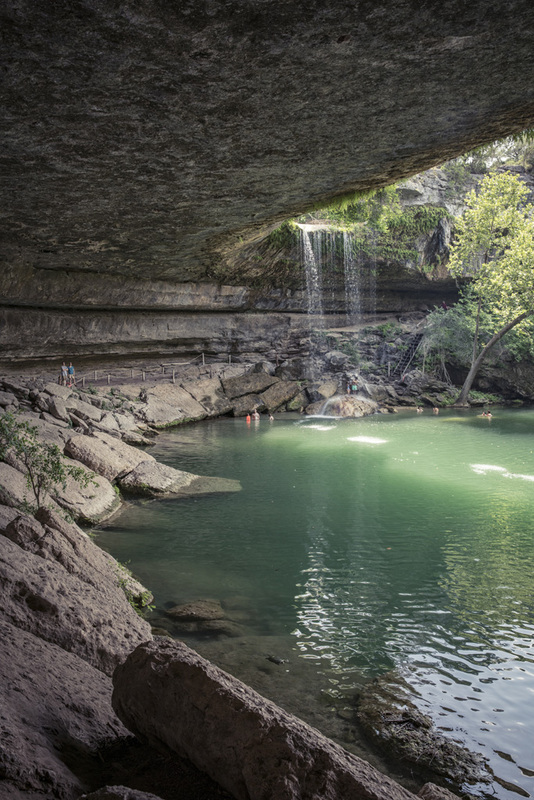 Located nearly 35 miles northwest of Austin, this lush landscape features a fern-filled, waterfall-topped grotto surrounded by knotty outstretched cypress trees. 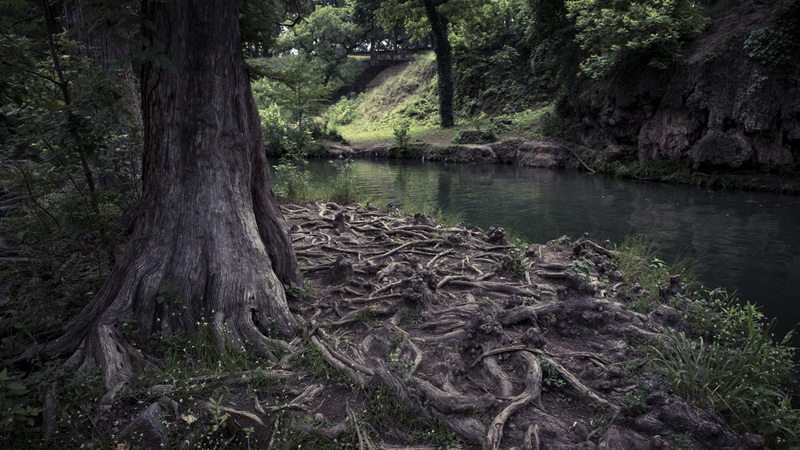 Listed in the National Register, the 115-acre property contains 32 springs, which flow into Cypress Creek and eventually Lake Travis. 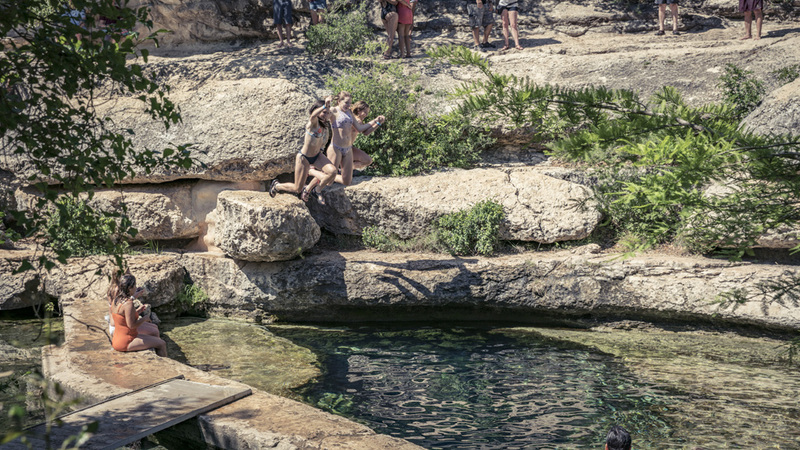 One of the springs feeds a man-made pool on a bluff, while others form the comfortably sized swimming hole. One of Krause Springs’ main draws is a rope swing affixed near a large boulder on the bank. Swimmers young and old grasp the rope and squeal in delight (or fear) as they swoop toward the welcoming water. 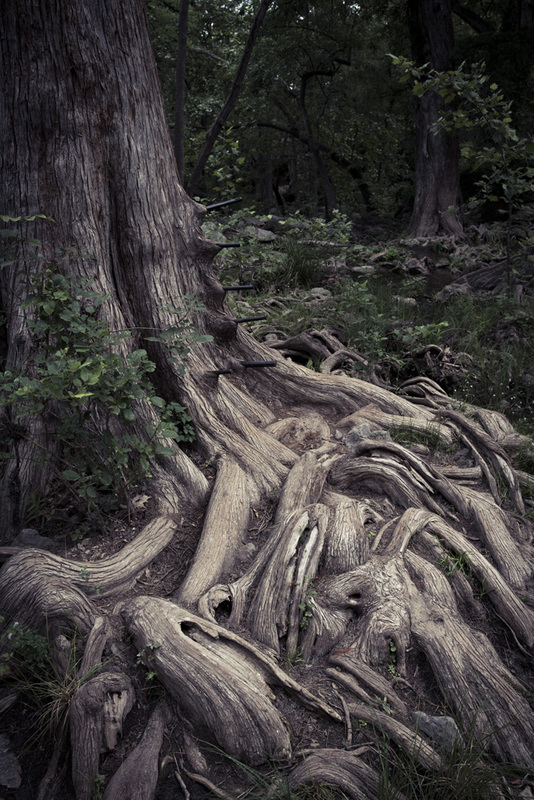 Krause Springs also offers camping and gardens for those seeking a low-key weekend getaway. 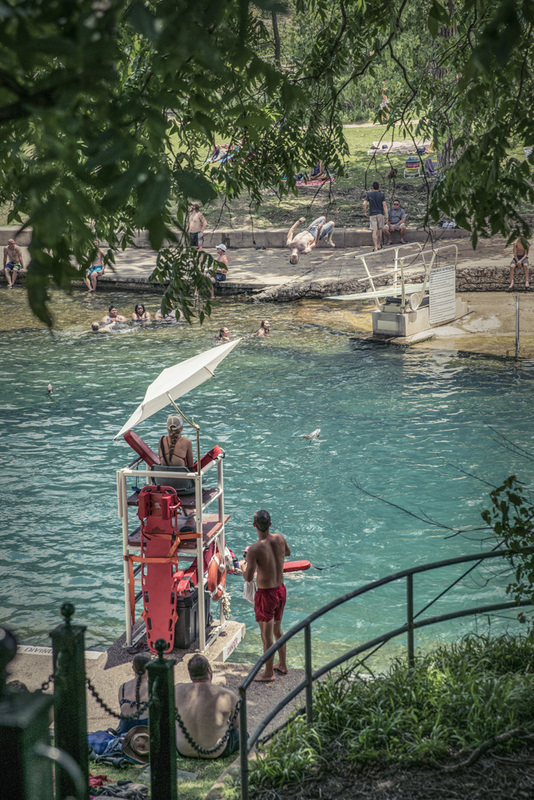 Located about 40 miles southwest of Austin, Wimberley provides summer travelers two fascinatingly different swimming holes to help beat the heat. 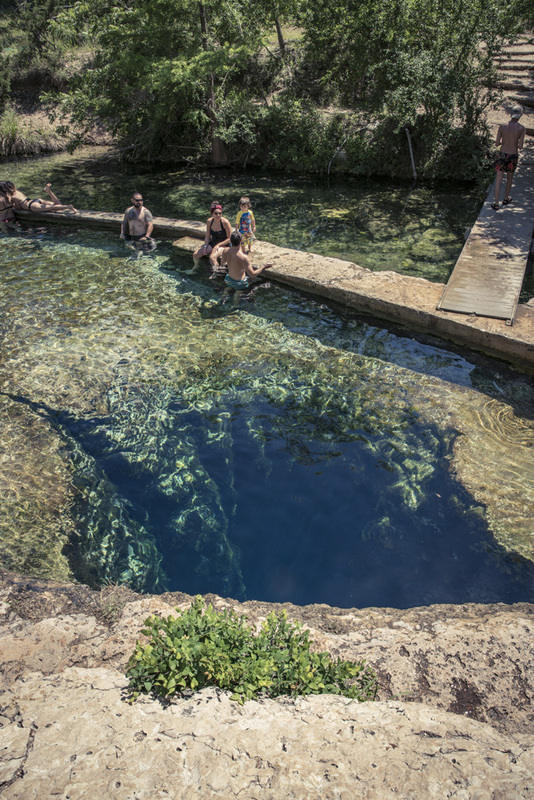 Among the finest in the state is Jacob’s Well, a Hays County-operated park featuring a 30-foot deep crystal clear, ice-cold natural pool. Visitors gather around a series of tall outcroppings to watch swimmers consider several jumping-off options. 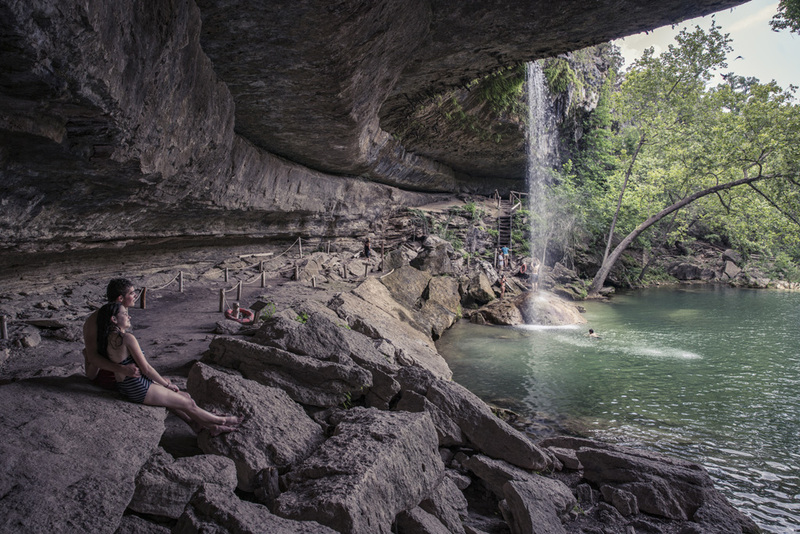 Teenagers scale the nearly 20-foot boulders to fearlessly leap into the chasm below, while children and adultsusually choose a lower rock for a swift dive or splashy cannonball. A few miles southeast, Blue Hole provides a lush landscape straight out of a postcard. Cypress branches form a vivid-green canopy over the clear blue water, punctuated by splashes from rope-swing jumpers. 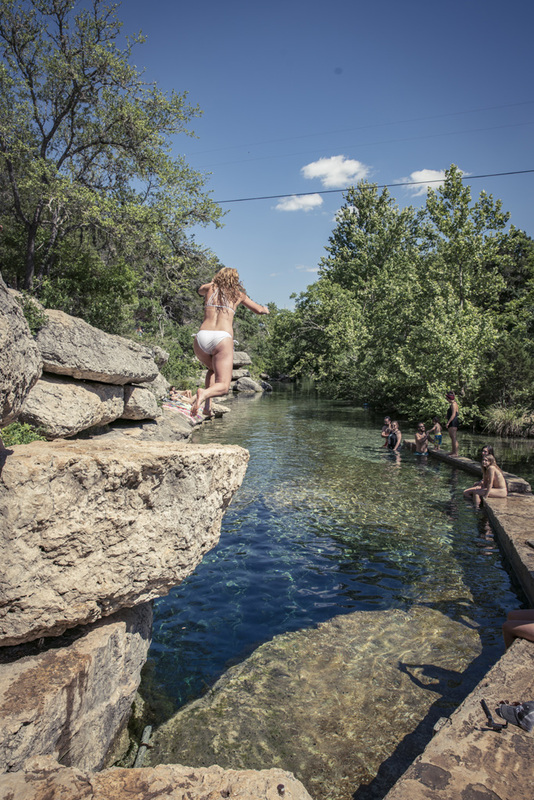 Surrounded by a 126-acre regional park with trails and picnic areas, Blue Hole offers visitors a picturesque escape unlike any other in Central Texas. Both sites encourage advanced reservations. 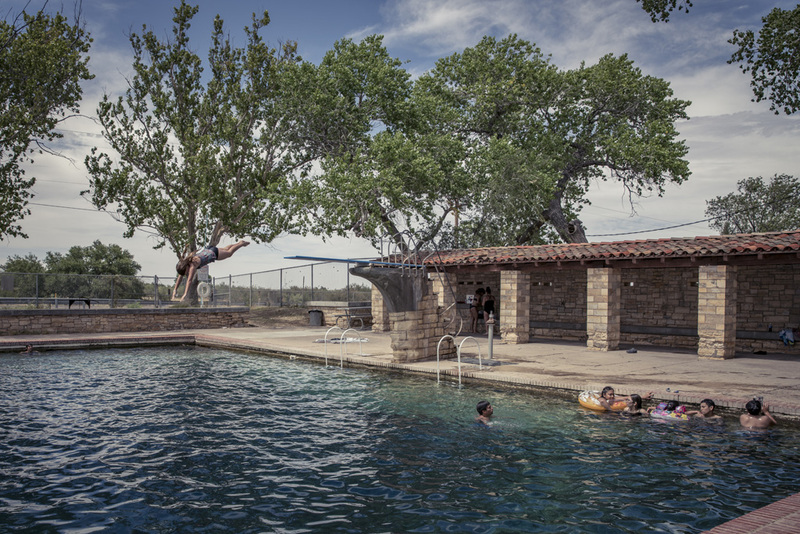 Balmorhea is an oasis on the edge of the Chihuahuan Desert. The 1.75-acre pool, concession building, two bath houses, and motor lodge were constructed by members of the Civilian Conservation Corps in the mid-1930s. These stunning whitewashed adobe buildings reflect the site’s arid surroundings and Southwestern heritage. According to Park Superintendent Carolyn Rose, the pool has averaged nearly 160,000 visitors the past few years. The strain on the site prompted park officials to implement a cap of 1,300 daily passes. On most summer days, the pool will host nearly that many visitors, who explore the vast pool by swimming, snorkeling, or scuba diving. 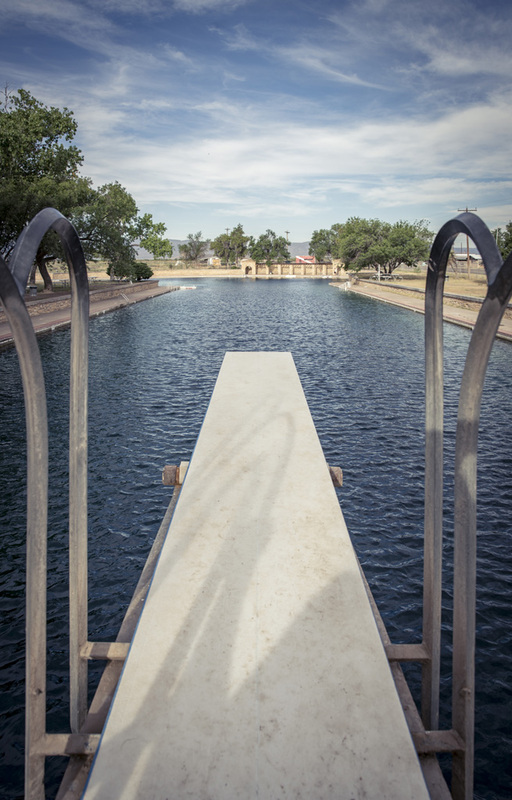 A major draw is the diving board directly atop the San Solomon Springs, which pump nearly 20 million gallons of 72-degree refreshment into the historic waters each day.